Conversions occur when a user visits your website and takes an action that you want them to take. That means if you want them to visit your website and sign up for a newsletter, buy something, or create a profile, they do just that when they visit your site. High conversation rates are key for a successful website and business. To that end, here are some popular website designs that convert well. These days, people are impatient. We are used to getting content at lightning speeds when we search the web. If a website doesn’t load within just a few seconds, consumers are very likely to leave altogether. This will make your bounce rate increase significantly. Take away unnecessary elements of your web design that lag the loading so your site meets the speed standards of your audience. High-quality images can certainly increase your conversion rate as well. Websites that lack images seem very boring to consumers, but websites with bad images aren’t great either. Use images sparingly, and make sure they don’t look like they were taken on an old flip phone. If you want to add many detailed pictures of a product, don’t display full-size images until the user clicks on the product to see more. 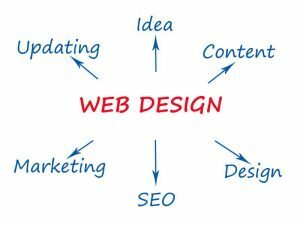 Almost all web designers will tell you that a call to action is essential if you want high conversion rates. When people visit your website, they want to easily be able to find what they’re looking for. If they can’t figure out what they’re supposed to be doing, they’ll leave. Did you know that four out of five consumers shop on a smartphone? Nearly 48% of users say that if they arrive on a business site and it isn’t working well on their mobile device, they take it as an indication that the business simply doesn’t care about their customers. If your audience thinks you don’t care, you certainly won’t get conversions. Make sure your website is always mobile friendly. There you have it, four website designs that convert, and convert well. For more information on conversion rate optimization, web design tips, and more, contact MRN Designs today.